Yes, that’s a pixel raccoon. Pearl Grey’s one year rez day anniversary is Monday. This photo wasn’t taken her first day. It would be awhile before I figured out how to take photos or even take any interest in them at all. 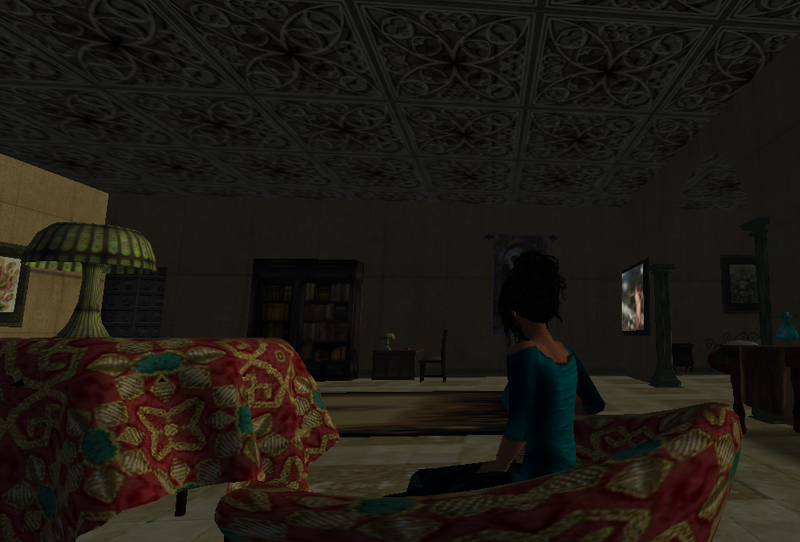 There’s a steep learning curve in Second Life and I’m not good with tech stuff anyway. 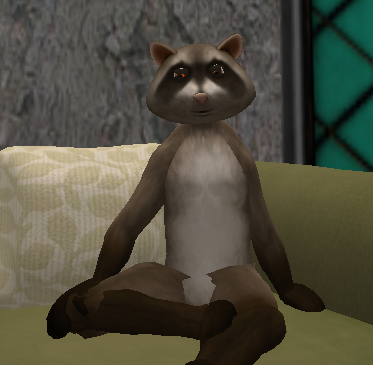 Pearl was actually a raccoon for at least a month. When picking a starter avatar I knew I didn’t want to be a robot or a vampire. Eventually she began to transform into a different appearance. I got her a freebie female shape and skin and have done some upgrades over the months. I’ve worked at keeping her safe as she’s evolved into the explorer and staunch believer in authenticity and freewill that she is today. On the evening of August first I had the pleasure of attending a Fair on the island of Serenity Falls. I’ve discovered a way I can travel there from TornOak by ship and a fairly safe portal. Just before I left, the publisher of the Nexus Gazette asked me to report on the event. One of the first things I’ve noticed is the fresh air and spaciousness although the city is dark. Many of the women were dressed in the latest fashions of their race and there were distinguished looking gentlemen there as well. For the most part, people were well-behaved and there were only a few weapons flourished, one most notably being a large sword. There were some familiar faces of those that have not only survived but opened businesses. Rose, formerly of the Ten Bells has a tavern. Miss Helene who’d been the owner of Tuski Haven has a most interesting shop. I was pleased to find that the local banker is female and much more civil than the Count ever managed to be. There were people from all over, including a woman from America who was on her first trip to Europe. A goodly number of the folk were winged, some of whom were very small. The small ones particularly laid claim to the berries and sweets on the very lavish buffet table. They appear to have the same sort of table manners as those of London had and seemed to enjoy themselves very much. There was a fresh bloodwine fountain, strawberry pie, an excellent assortment of cheeses, fresh home made lemonade and a delicious stew. 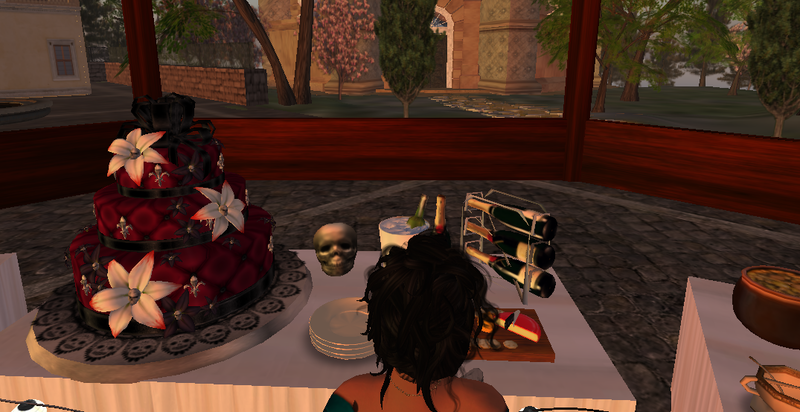 The most popular item was the very special cake which had an uninhibiting effect on those who partook of it, causing a most shocking public behavior which perhaps is acceptable for the local culture. For awhile it appeared that some violence might break out and there was tension which seemed to be amongst a group of mostly demonic ones. Some of them looked familiar to me and I learned they are of the Clan Seid who were connected to Fiendish Pleasures in London. My sources, if correct, indicated that the powerful Madame Vedis has established the island for survivors of the recent catastrophe to find a sort of sanctuary. There were whispers of a price to be paid which may be of concern at some point but this was an evening of enjoyment, conversation and dancing in the square. There were opportunities for folks to wander about and discover the many venues and charms of the island. It is mostly clean and well-kept although I was startled to find that at least one of those crazed squirrels from the park has made it’s way to Serenity Falls. None of the zombies, which I’ve seen with my own eyes, disturbed the guests in the square which was decorated in a most appropriate Midsummer Night’s theme. I wandered amongst the crowd, listening for talk safe and decent enough to write about. It was difficult to discern who were visitors and who are residents of the island. Perhaps some will be part-time residents such as myself? I can’t help but wonder who might live in the dark caves near my apartment. There were faces I recognized from London who’d been outside of my circle before. Most seemed to have weathered the recent changes well enough although a few I’ve concerns for their sanity. One in particular, a very bewildering case beyond my comprehension. I felt at home as others seemed to as well. Someone there certainly knows how to organize an event that can be enjoyed by all. I did wonder about the peace keeping and law of the island while the moments of tension and veiled threats were occurring. It was quite healing to have a festive social event after the recent tragedies that have scattered those of London to the four winds and ends of the earth and beyond.